Shamim and Jason each have 30 years of experience behind our dentures, and we will usually have them finished within a month. Your dentures can make a world of difference to you. They should fit well, be comfortable and look like natural teeth. Dentures are made by a skilled team, led by your clinician, who with skilled technical work being done by technical staff, in a separate dental laboratory. 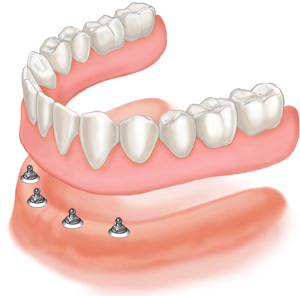 All dentures should be well made and crafted to your own personal needs and budgetary requirements. How would you like them to look? Hopefully the answer is "so nobody will know"! Making good, lifelike dentures is something of a dying art and there is a huge push to the “higher end” treatments such as implants and bridges so that we can forget that sometimes the simple treatments can be the most effective. Freedom? A bold claim, but a valid one. There is something really simple to fix the problem. We are now able to offer mini-implants which can be life changing for those who have been plagued by loose and poor fitting dentures. Dentures are not the beginning of the end or only for old people. They can protect your remaining teeth, can be precision fitting or a temporary measure until your mouth is ready for something else. How natural do you want your teeth to look? How well do you want them to fit? Do you want to eat properly? Do you know someone who has a terrible time with their dentures; do they take them out to eat? We strive to get all of these questions right. Not everybody wants small white “false” teeth. Then again, a few do! How they look is up to you. How they fit….well, that is something we will discuss with you before starting. Wouldn’t it be great to have nobody know your teeth are only yours because they are bought and paid for?